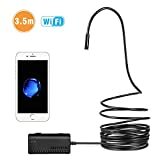 The Depstech WiFi Borescope Inspection Camera has been one of the most popular products we cover for about two years now, and we don’t see that changing anytime soon. This awesome 12-foot camera lets your smartphone see anywhere by snaking through even the tightest spaces, and you don’t need to mess with cables because it connects to your iPhone or Android phone wirelessly. It’s a killer value at $36, but use the coupon code XHUQOC66 at checkout and you can snag one for just $29.99. That matches the updated version of this camera’s all-time low!